That's all folks !!! Hope all of you have enjoyed the coverage !!! Its over !! India lose to France 0-2 !!! 85' After a string of passes in the midfield .. France goes for the kill via a long ranger, but Gill was in control to put the ball away !!! 73' GOAL !!!! France double the lead !!! 70' France get a corner, but the Indian defenders stood tall in front of the goal !!! An Indian player is shown a yellow card !!! France looking dangerous as usual .... they are taking several shots at the target but somehow the Indian defenders are denying them to double the lead !!! The sides have changed ... but the story remains the same ... France dominating throughout !!! 42' France get a corner ... it was cleared by Jitendra !!! The Indians were trying to build-up an attack ... but they give away the possession mid-way !!! We are approaching the end of the first half, it has been a one-sided affair !!! 37' India get a corner, but the French defense was alert, it was cleared easily !!!! Score update: India 0-1 France !!! Boris Singh and his other compatriots are very busy guarding the goal .... France U19 desperate to get the lead !!! The Indian team is trying to make constructive moves, after complete dominance from the French in the opening minutes !!! Indian's living dangerously at the moment .... the ball could have easily pieced through the net !!! The defenders had no clue !!! 8' France U19 players comes up with a lethal attack, but Parabsukhan does well to put the ball away !!! We are moments away from the kick-off !!! Welcome to our live coverage !!! After a forgetful opening match against Croatia U19 in which the Indian’s lost 0-5, Floyd Pinto’s side put up a much improved show in their fixture with Slovenia U19 where the Indian colts lost by a solitary goal. 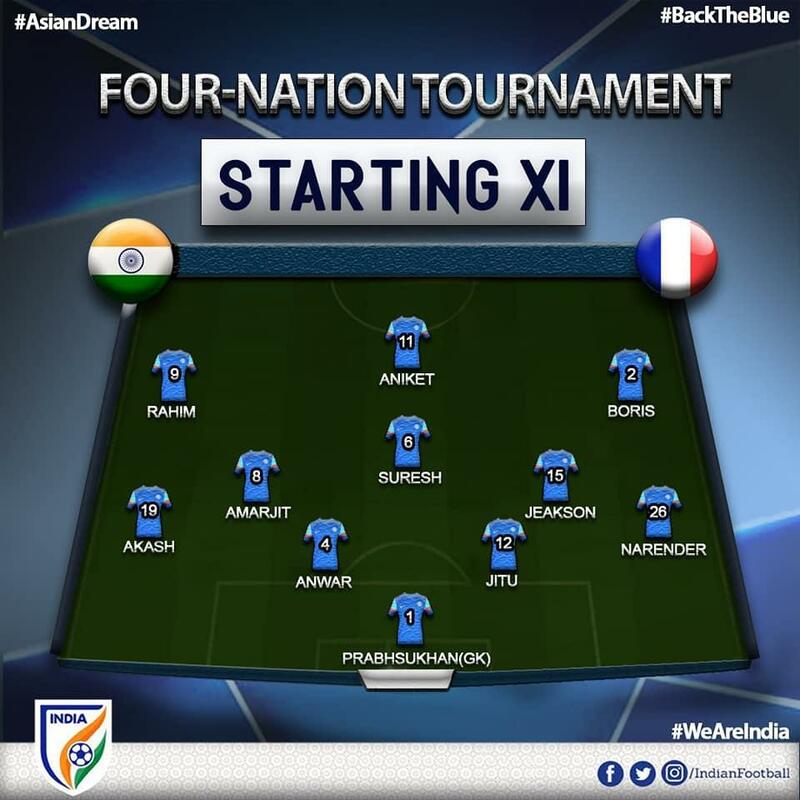 The ‘Men in Blue’ will be against the boys from France U19 in the final match of the four nation’s tour, which promises to be the toughest 90 minutes for the young boys from Asia! The India U19 team was blanked the first game against Croatia U19, conceding 4 goals in the first half itself. Apart from a few positive moves early in the first, Amarjit and Co. produced nothing to be true. In the second game, Aniket Jadhav and Suresh Singh had clear chances to convert but were denied. This will be the last chance for the Indian team to good use of the opportunity of playing against quality outfits in alien conditions! The Indian team has been in Europe as a part of AIFF’s exposure tour. They will travel to Serbia following the match against France U19 for a couple of friendlies against the Serbian U19 team.